The questions consequently owe a lot to the venue and to the crowd who attend. 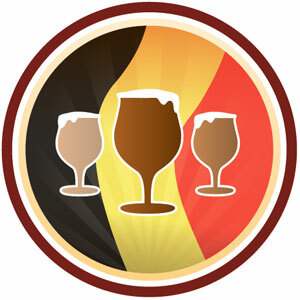 I spoke to Chris Lemahieu, head honcho of the event in Bruges, about what he considered the core differences between the oft-cited Belgian-style and British/Irish table quiz traditions. He cited (paraphrasing here, any errors are entirely mine) the difference between trivia and knowledge. Take, for instance, a question on naming a famous painter. The first is based on how it may have been posed at the EQC. The second is more table quiz style. He died aged only 37 in Auvers-sur-Oise, France, having sold only one painting in his lifetime. In the words of art critic Sue Hubbard: “At the beginning of the twentieth century, he gave the Expressionists a new painterly language that enabled them to go beyond surface appearance and penetrate deeper essential truths.” This painting, right, is said to be his magnum opus. Which Dutch/impressionist painter cut off his left ear, wrapped it in newspaper and handed it to a prostitute named Rachel, asking her to “keep this object carefully”? 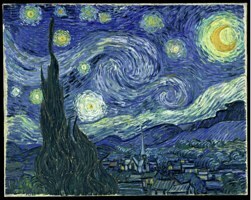 It’s Van Gogh obviously, with my favorite, Starry Night. Ok, they’re simplistic efforts (the 2nd would more likely go along the lines of “Which Dutch painter, famous for chopping off his ear, painted Sunflowers?”), but the point is that pub quiz questions tend to be shorter, what/where/when/who format questions that can be read aloud in an environment where background chatter etc may make long questions unclear. In Bruges, all questions were either written down on a sheet (solo/duo format) or else read aloud with the full text of the question on a PowerPoint slide. Questions could contain 50-100 words! Back to the substance. Trivia, as defined as ‘Details, considerations, or pieces of information of little importance or value’ are the cornerstone of pub quizzes. Any frequent pub quizzer could give you half a dozen nuggets on Van Gogh without ever having seen his work, or any appreciation as to his significance in the art world. As Chris was kind enough to say, that doesn’t make UK/Ire quizzes any less valid, just different. He stressed that Belgian quizzes were based on knowledge – a Belgian quizzer might not be able to tell you what year Van Gogh was born, but he could recognise his paintings. Which is the greater feat, I’ll leave for you. Obviously, 100-word questions don’t lend themselves well to TV gameshows, but John, Dave and I very much enjoyed the challenge of drawing on vague memories of secondary education, assembling a decent answer from tangential information we’d picked up and some good old-fashioned guesswork. One the areas that I personally saw the greater merit in these questions was with one of my frequent bugbears: name the year. There’s no reward in being a digit out, nor any greater punishment for being a century too early/late. What is that testing, really, other than someone’s speed in surreptitiously opening Wikipedia on their iPhone under the table and getting an immediate convenient info box? Two answers per question. Eg. in the movie quiz, we were asked to identify a movie based on a snippet of dialogue or a screenshot. Then a secondary question, already written on the answer sheet, asked us to name the director. Acrostic round: The first or last letters of the correct answers in this round form an acrostic. Done properly, you can also place the answers in a crossword. Anyway, I’ve rambled enough. To quote John briefly, from his interesting post on a record-setting low-scoring quiz, “…is there a flaw in the way most Irish table quizzes are created? Do question setters, perhaps, consider their potential crowd and then design a quiz to suit them more than to really test them?… To take it further, is there a vernacular in the Irish table quiz world? Could the spectrum of knowledge tested at table quizzes be considered a ‘specialist subject‘ in-and-of itself? This is a disquieting notion.” Our experience at the EQC was eye-opening. I wouldn’t like to replace the pub quizzes we know and love with questions on Polish harpsichordists, but I think there’s a lot of room for improvement. Rather than pander to the crowd, especially in larger-scale, higher-quality quizzes, why not really challenge them? Rather than retreading tired old ‘quiz knowledge’ as if it were a specialist subject in itself, why not reintroduce themed rounds if it separates parrots from those who actually have a wide breadth of knowledge? I gather ourselves and the British teams were in the minority when it came to team construction: Belgians, Germans and Norwegians espoused their theory to me that four specialists were better than four all-rounders like ourselves, but I wonder? I definitely think that table quizzes in Ireland are oft written with the likely participants in mind… more obviously at fundraising quizzes (somewhat understandably) but in local pub quizzes you will nearly always find questions local to the town in which the quiz takes place. It would be interesting to see the euros in Ireland… and how the ‘dry’ quizzing nations perform after a rake of pints with every round littered with people roaring ‘witty’ non answers at the stage. You could equate it to links golf and non links golf… the truly great golfers can hold their own in both. Smart phones are a disaster in pub quizzes. Don’t know why quizmasters do not put a basket/pint glass in middle of every table requesting mobile phones to be deposited there before a quiz starts. The alternative to this is to adopt the Bruges approach of less google friendly questions. Great website by the way, John. Love the Thursday night show too.